A grindstone is a round stone used for grinding or sharpening ferrous tools and was an indispensable necessity on any working farm. An abrasive material is rubbed against the cutting edge to be sharpened or shaped. Grindstones came in a wide range of grit sizes (the sharpening surface substance must be harder than the material being sharpened), with the most traditional material being a natural stone such as sandstone or granite. The typical “farmyard” grindstone would have been used to sharpen ax blades, knives, hoes, and other farm implements. Small amounts of water dripping on the stone as it turns (wet grinding), keeps the stone from over-heating. Early grinding wheels, rotated by two cranks, one on each end of its axle, date from around 1340. Circa 1480, the early medieval rotary grindstone was improved with a treadle and crank mechanism. Pedals to power the rotating lathe allow the operator to speed and slow the stone. 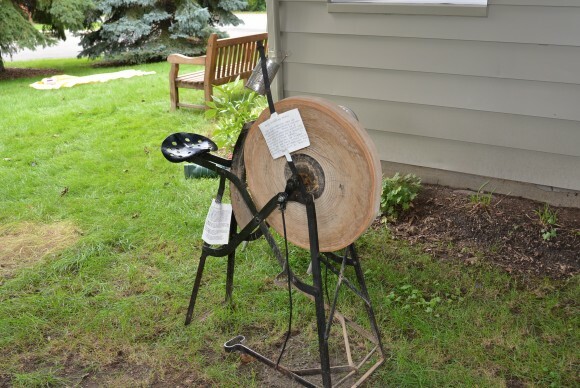 The Orchard Lake Museum’s grindstone, once owned by Mrs. Albert D. Noble, is a ‘one-person’ grindstone with the wheel being turned by a pushrod connected to a foot pedal. The museum’s grindstone is on display at all Open Houses (second Sunday of each month from 1-4 PM). And what about the adage of ‘nose to the grindstone,’ meaning to continuously work hard? The first known citation is found in John Frith’s A Mirrour or Glasse to Know Thyselfe, from 1532: “This text holdeth their noses so hard to the grindstone, that it clean disfigureth their faces.” All early citations refer to holding someone’s nose to the grindstone as a form of punishment and comes from the practice of knife grinders, when sharpening blades, bending over the stone or even lying flat on their fronts with their faces near the grindstone, in order to hold the blades against the stone. 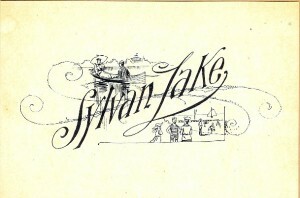 Sylvan Lake’s history dates back to 1818 when an expedition led by Rev. John Montieth rode into the area to see what lay between Detroit and the newly established post of Pontiac. The expedition discovered a chain of lakes. 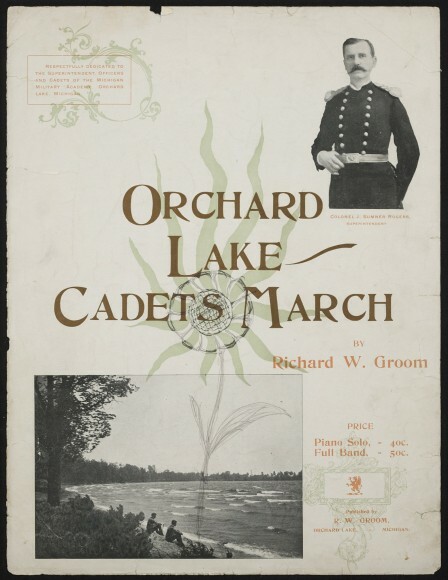 The lake which lay closest to Pontiac was surrounded by a fringe of tamaracks and was considered by the group to be the most beautiful. The explorers named this body of water Timber Lake, afterward changed to Sylvan Lake.